Posted on April 16, 2014 by Worth Stopping By . . . Spinach is considered one of the most nutrient rich foods around. It is packed with vitamins and minerals that provide you with powerful antioxidants. Choose leaves at are crisp and dark green in color for the most nutritional benefit. 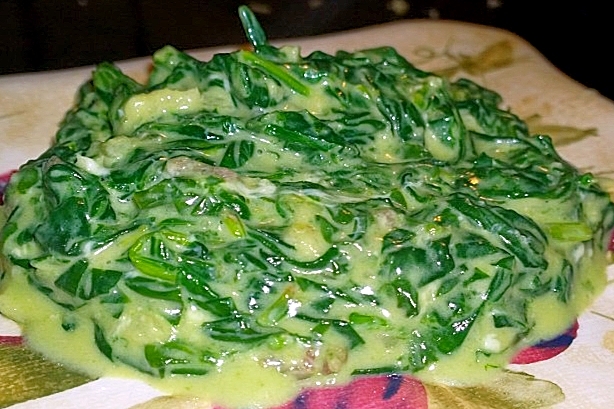 This recipe (from all recipes) combines beautiful, chopped spinach with cream and cheeses for a wonderful accompaniment to any meal. 1. Heat a large skillet over medium-high heat. Add spinach and cook until wilted, stirring constantly. Remove from the skillet and drain in a colander. Try to squeeze out as much liquid as possible. 2. Melt the butter in the skillet over medium heat. Add garlic and onions; cook and stir until tender, about 5 minutes. Add the spinach and stir in the heavy cream. Sprinkle in the provolone cheese and stir to melt and coat the spinach. Once the provolone has melted, stir in the Parmesan cheese and continue to cook and stir until thickened. Season with salt and pepper and serve hot.